365 days a year, Mobile Loaves & Fishes’ volunteers hit the streets of five cities to serve the homeless. They have served over 4.5 million meals in five cities, across four states over the past 16 years. 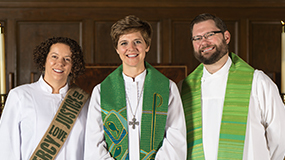 Today, FUMC plays an integral role in this ministry. Our “Downtown Alliance of Churches” MLF truck is staffed by volunteers from at least eight different churches. 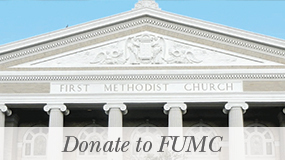 FUMC provides the kitchen for meal-prep and serves as the home base for the Downtown MLF truck. Our truck goes out nearly every day of the year (about 330 times last year) to provide meals, clothing and hygiene products to the homeless and working poor in our community. Have you wanted to learn more about MLF through serving on a make-ready team (preparing the food and loading the truck) or on the truck team (actually delivering the food to our hungry neighbors around Austin)? We have started a new run on third Sundays for first timers to serve. This is a great opportunity for all ages to give this ministry a try and experience first-hand feeding, loving, and helping those men, women, and children who need it most. Each run will have 1-2 Team Leaders who will be there to guide and share their experience with MLF. Last year, our Downtown truck provided over 26,000 hearty meals with the help of more than 350 dedicated volunteers. It costs over $67,000 to fund this ministry each year. If you would like to contribute to this ministry, click here. 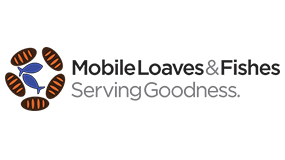 For more information about the Mobile Loaves and Fishes ministry at FUMC, contact Scott Wilder at swilder21@gmail.com or 512-971-1525.